Daddy came to wake Esther up at 5:30 am because she was going to work with him and I woke up as well. I decided to go ahead and get up. It's always easier than going back to sleep (at least, for me it is). The morning is my usual time for getting on the computer and getting all my main stuff checked, so I got something to drink and sat down to check my email and the blogs I read the most. After eating breakfast, I took a shower and put on a brown flared skirt that I got at Walmart last year. I also slipped a blue t-shirt, intending to change it before I left for work. 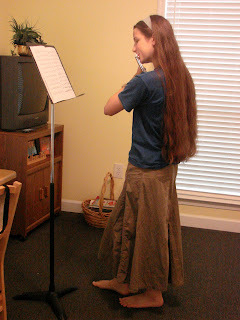 After piano, I practiced flute. Sometimes running all the scales can be fun, sometimes it is tedious, always depending on the mood I'm in. It wasn't so bad this time, though I was slightly hurrying to be done. 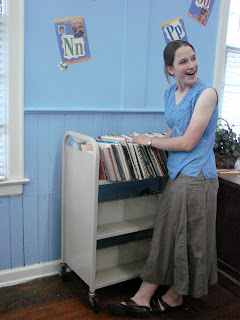 I changed into a light blue sleeveless top I found a Goody's last year. It's always hard to find modest sleeveless tops, so I was delighted with my find. Then I headed for the library. Once arriving, I again shelved books before we opened. Once we opened, I really didn't a whole to do until 2 o'clock when the program would start. So, I checked my email and blog, then ate lunch. I walked around the library for a little bit and went down to the basement (always an interesting place), which resulted in a neat find. I found a movie called LadyHawke which my parents had told me about but I had never seen it, so I got the movie to take home. I was sitting at the main desk when the children began to pour through the doors and for the next hour, I was busy checking books in, checking books out and highlighting the kids book logs. 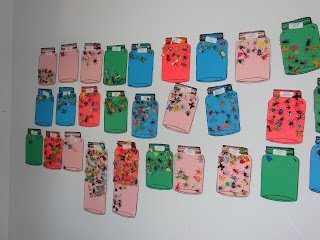 Our bug jars on the library wall. There are four other walls covered in jars. When the program ended and the storm (I mean, kids) left, we all sat and took deep breaths. Then Mrs. Sharon (our librarian) , Matt (another volunteer), and I walked into the our children's section of the library to look at the "damage". When 100+ kids romp and play in a room at the same time, it's bound to look pretty bad afterwards. Books falling off of shelves and toys all over the place, as well as a desk mounted high with books needing to be put up. It took us about the next two hours to put everything up. It's so nice to see it once it's clean. Mother picked me up around 5:15 pm and we headed home. Mom and Dad had fixed chicken and sweet potatoes for supper and I was quite hungry. 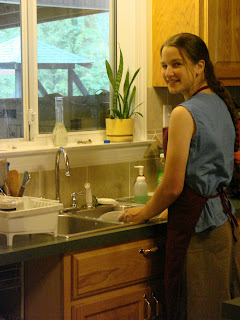 Esther had a late violin lesson, so she and Mother left for that and I cleaned up the kitchen while listening to Casting Crowns. Once done with that, I sat down at the computer for awhile to get some things done. When Esther and Mother got home, we watched the movie I brought home from the library. It was pretty interesting. Then we all turned in for the night. I stayed up a little while reading, then my eyes began to close, so I too turned out my light. Children are so wonderful to work with. I babysit A LOT and love it! Your outfit is so beautiful! That top is girly and pretty! I wish it was easier to find more modest clothing! Hi, first time posting a comment here, although I've been reading on and off for about a year now. I play the piano and the flute as well, and when I was younger I never could split my concentration or love straight down the middle -- one instrument was always more favored than the other. 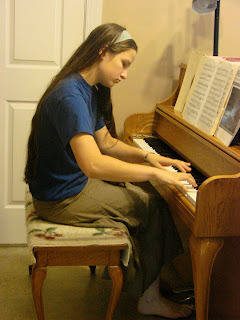 Eventually, I ended up favoring the flute, and, well -- nowadays I think I should probably have stuck more with the piano. Anyway, do keep up the good work; it's so wonderful to be able to play musical instruments, isn't it? > "Then we all turned in for the night. I stayed up a little while reading, then my eyes began to close, so I too turned out my light." Great ending! You're a good writer! That blue top is very pretty! Your hair is so pretty, Miriam! =) I'm glad you have fun working at the library! This is my favorite outfit out of the bunch. Rarely do I see a no-sleeve top that I like, but I love this one. I agree, your hair is beautiful!